Next, click on the Enable PPTP server radio button. For the Server address put in your WAN (public) IP. For the Remote address range, put in a local IP of which the range will start at. Near the end of the page, check Require 128-bit encryption. Click save and click on the Users tab. 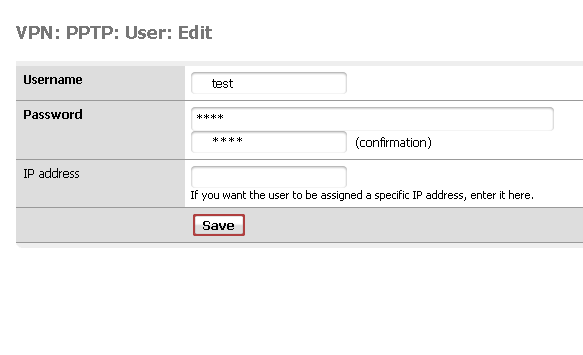 Add a user, in this example, test and a password. You can enter an IP of which the user will be assigned but it's not neccesary. And that's it! You now have a working PPTP server. Now, I tried to connect with my iPhone 3G over Wifi. Worked fine. Over 3G? Nope. Did some Googling, it seems like you have to pay an additional $10 for a VPN option (I'm on Rogers) since Rogers gives you a LAN IP (such as 10.x.x.x) and firewalls the GRE protocol (of which is needed for a PPTP VPN to work). It looks like the only way to get around this is to buy the $10 package, browse over to unlockit.co.nz on your iPhone, change your APN settings and voila.